The Colombo Commercial High Court yesterday ordered National Freedom Front Leader Wimal Weerawansa that compensation of Rs. 10 million be paid to JVP General Secretary Tilvin Silva. This is for publishing and distributing the book titled Neththa Venuwata Aththa in violation of provisions of the Intellectual Property Act. In his judgment, Commercial High Court Judge Ruwan Fernando ruled that several articles contained in the concerned book have violated the publication rights, economical rights and moral rights coming under the Intellectual Property Act No.36 of 2003. Meanwhile, the Commercial High Court further issued an order restraining Wimal Weerawansa from printing, publishing, selling and distribution of the book titled Neththa Wenuwata Aththa. The lawsuit filed by plaintiff Tilvin Silva for violating the provisions of the Intellectual Property Act by publishing the book had cited its author Wimal Weerawansa as the defendant. 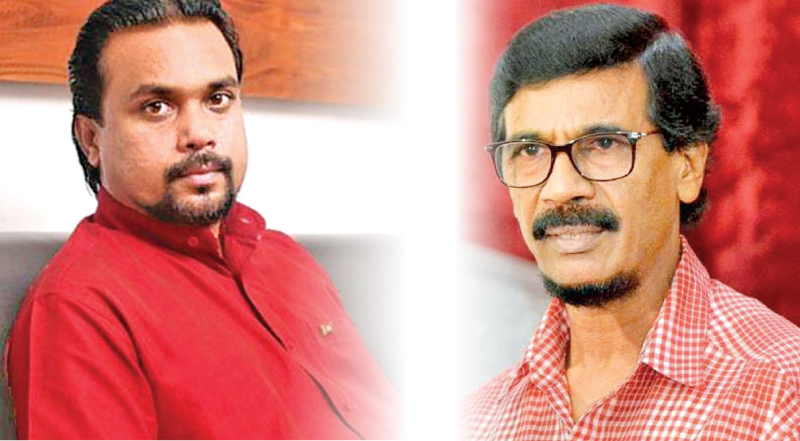 The plaintiff alleged that the book by Wimal Weerawansa was nothing but JVP political opinion that was submitted before the JVP Central Committee. At a previous occasion, Colombo Commercial High Court Judge decided to terminate the case proceedings into a case filed by Somawansa Amarasinghe over the same issue after both parties informed Court that they were willing to settle the case. This lawsuit had been filed by JVP General Secretary Tilvin Silva on July 24, 2008. Counsel Sunil Watagala with Ms Shanika Silva appeared for the JVP General Secretary. President’s Counsel Ali Sabry with Counsel Kapila Gamage appeared for the defendant. In his plaintiff, Silva alleged that Wimal Weerawansa has authored or claimed to have authored and published and caused to publish a book titled Neththa Wenuwata Aththa and have marketed the said book for a sum of Rs. 250per copy. He further alleged that the said book had been re-printed and published within a week of its first publication and he has economically benefited out of such publication. Silva further said Wimal Weerawansa has included several un-published letters authored by him which are his original work in the said book without his consent or approval or authorization. Prior to legal action, JVP general secretary had sent a letter of demand in 2008 demanding Weerawansa to immediately cease and stop printing publishing distributing and promoting the said book in violation of his Intellectual Property Rights and to pay a sum of Rs. 10 million for the damages.